Welcome to My Red Cape. 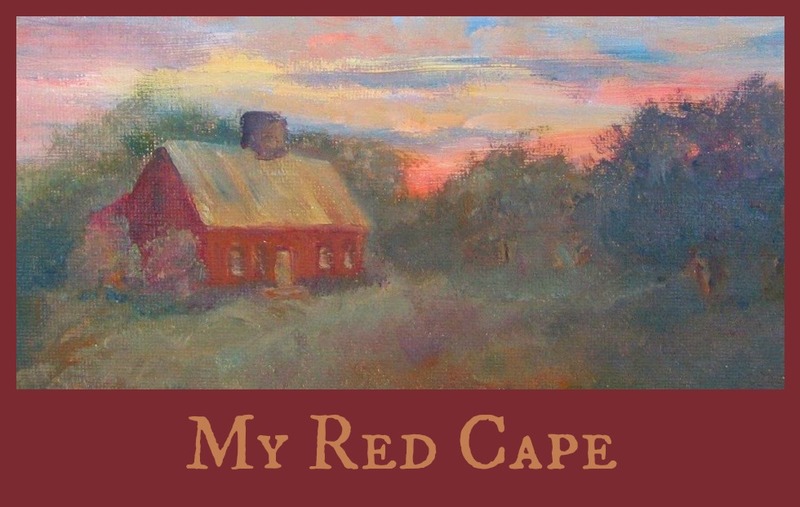 Long ago in another time my husband Jack and I lived in a little old red house. It was the stuff of dreams to us for the few years that we were there. I live there still a number of hours every day in imagination, with old dolls and paintings and fabrics and feather trees. I draw inspiration and happiness from the memories of that space in time and share some of it here with friends who remember how to step with Alice through the looking glass and take delight in whimsies and antiquities. Simple tube dresses for dolls. So many dolls to dress. When I do not find an old doll dress in my small stash of them I usually resort to a time honored way with a tube dress. Here is a lovely perfect little parian Alice showing the new body I made for her this spring. 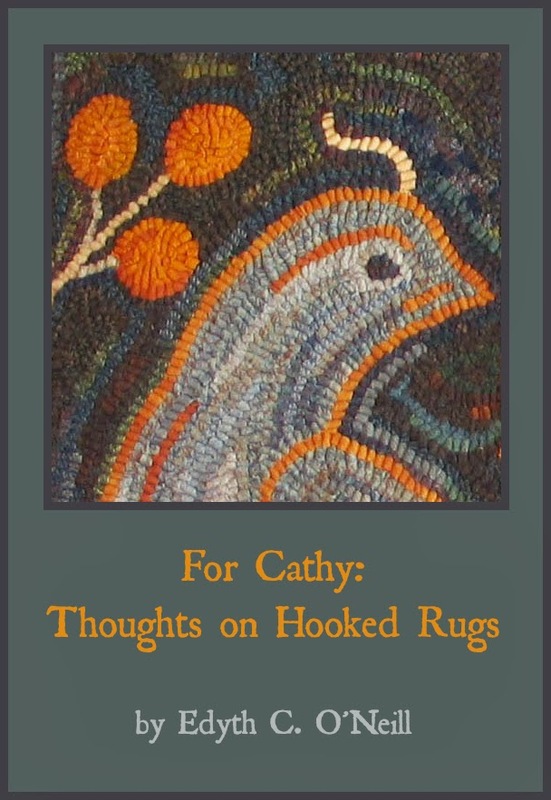 My friend Penny shared the sweet piece of early fabric some years ago and it has been waiting for the perfect use. The fabric was salvaged from the back of a ragged quilt. The first step is to cut two rectangles for her sleeves and one larger one for the body of the dress. Next sew the rectangles into 3 tubes, hemming a closing in the center back seam. Hem each sleeve. On each side of the dress body, make a slit longer than the sleeve will be set in, so a dart can be created on each side with the sleeve tube inserted. Be careful sewing in the sleeves, keep right side to right side. This is the only tedious part on the project. It is not easy to see where to hem the dress yet, so I leave that till last. Beginning at the back of the neckline I turn under a scant 1/4 inch with a raw edge. I run a gathering thread (double thread) about 1/8 inch from the top of the fold leaving that 1/8th inch header. By making a back stitch where I begin , leaving a few inches for a tie, and ending the same way after I fit the dress to the doll's shoulder, I have the neckline gathered and a tie on each side. Now try the dress on her and distribute the gathers. Judge where you want to make the line of gathering for the waist and make that row of little stitches leaving a tie at the beginning and after fitting the dress on her, make a tie on the other end. Now you can see where to hem the little dress. The addition of a ribbon at the waist or an apron finishes the outfit. In this case I have given Alice the incredible tiny apron with Van Dyke points in a caramel colored print. The apron is barely over 4 inches long top to bottom! A great many frozen Charlottes are dressed with a gathered tube and some trim added. These are usually sewn on the doll after they are gathered on her. I have a number of dolls costumed this way, Keep in mind the many sleeve shapes and lengths that can be used. Bits of tatting or other trim can vary the look as will the addition of a cape or shaped apron. 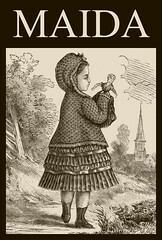 This early doll is most unusual. The head looks like a milliner's doll having a papier mache shoulder head. Not so. The complete torso and head are made in one piece of wood. Some few dolls were made like this with mache or something similar molded around the wooden core of the head. That type is sometimes termed an alien head. This entire head appears to me to be made of wood as everywhere the finish coat of gesso is scuffed the wood is right there for her nose and hair and so on. I believe her to be a transitional type and a laboriously constructed one of which there would not have been many before the millions of papier mache heads were made. The torso and head are all that we got. Jack carved arms and legs and I added cloth to hold them in place with out any glue or nails or such. The hair style is from the 1830's as you can see. Several times a month or even several times a week when other things are not crowding in, I stop by our local Hospice thrift store. So often I pick up nothing or just a magazine or so, (art magazines a favorite) and wander out wondering why I bother. But about twice a year I come out grinning and I know why I go there! Today is such a day! 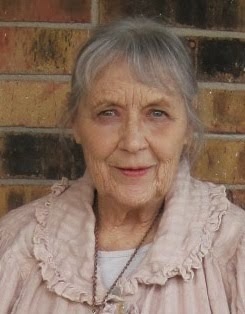 My friend Linda is working on her home and has said she needs more closet space, having taken one for a little office. "A good old wardrobe would be a great help, but when would I ever get one?" So here it is and I just walked up on it and called her to come quickly. 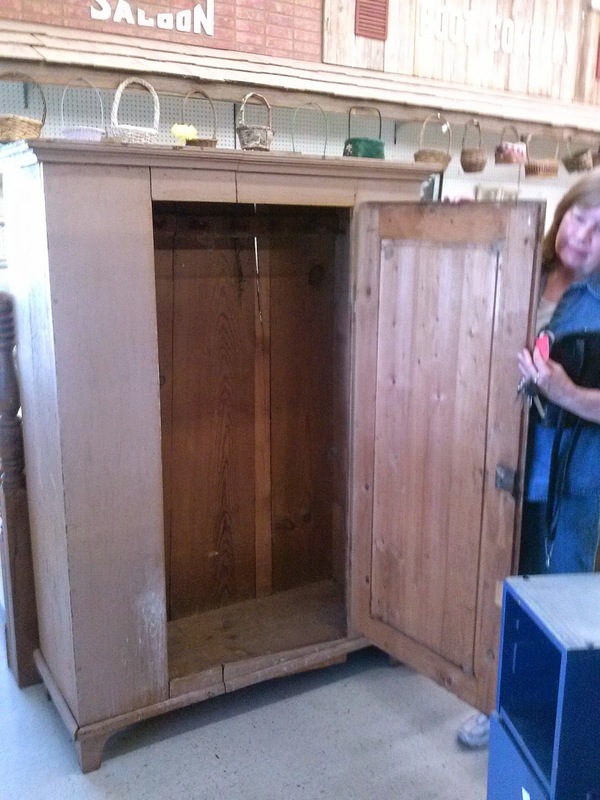 This one is constructed with wooden pegs and looks to be Texas German, likely local here as it has been in a shed where dirt dobbers have built many nests inside. If it had been in the hands of a collector or dealer it likely would have been cleaned at least somewhat and then of course might have been hauled from anywhere similar pieces were made. 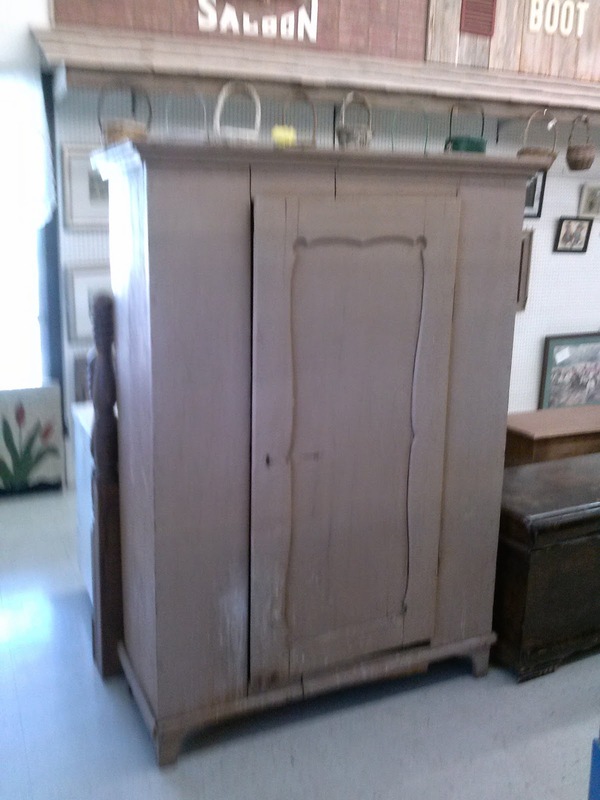 The wardrobe has only one very old coat of gray paint on the outside, and shows its long leaf pine inside and on the back. Its small size makes it so much more usable than the often huge ones. This one is barely taller than Linda herself. Opening the door reveals the original peg rack in the upper back, with dear old hand made pegs to hang garments. The piece is entirely undisturbed and needs just cleaning and tightening of one loose board low in front. Linda is as thrilled with it as I knew she would be! Gray stoneware and baskets will look wonderful on the broad top, and Linda has loads of those. edyth, doing the happy dance! 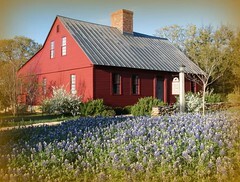 Photos Paula took visiting me in Fredericksburg! Here is the tall case clock I purchased yesterday for my doll family. The height is 44 inches. It is pictured here on my dining table with a full size old American painted clock in the back ground, as well as with a group of dolls. 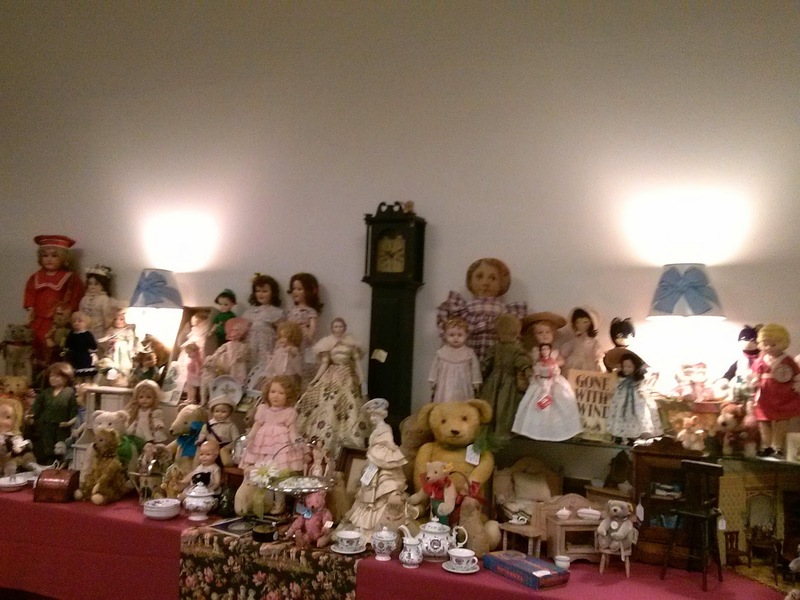 This post on her blog shows two Queen Ann style dolls playing on the old clock. 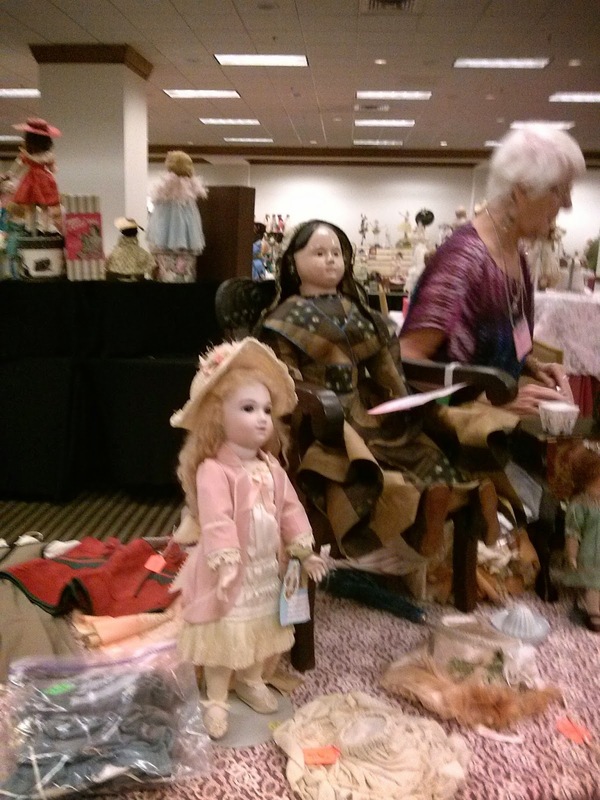 Doll show in San Antonio today. 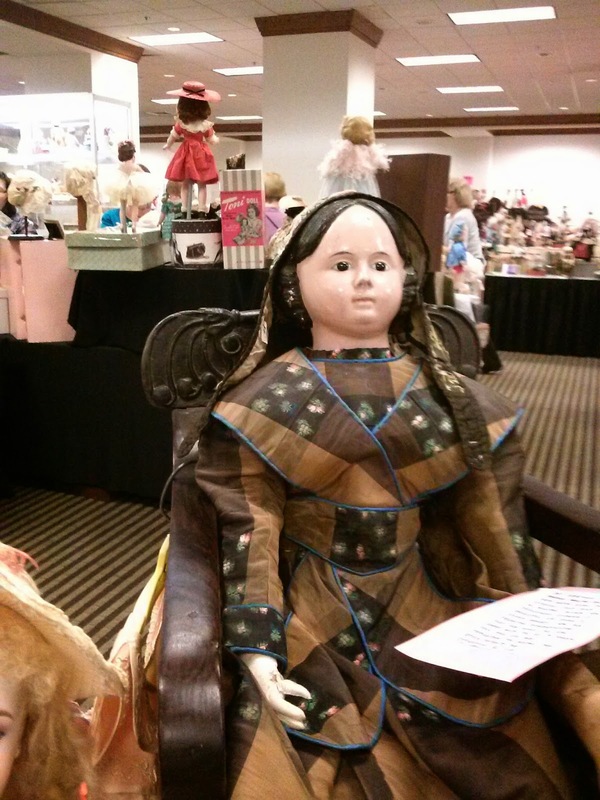 I have never attended a nice antique doll show before , auctions yes, good shows no, which made today so special! 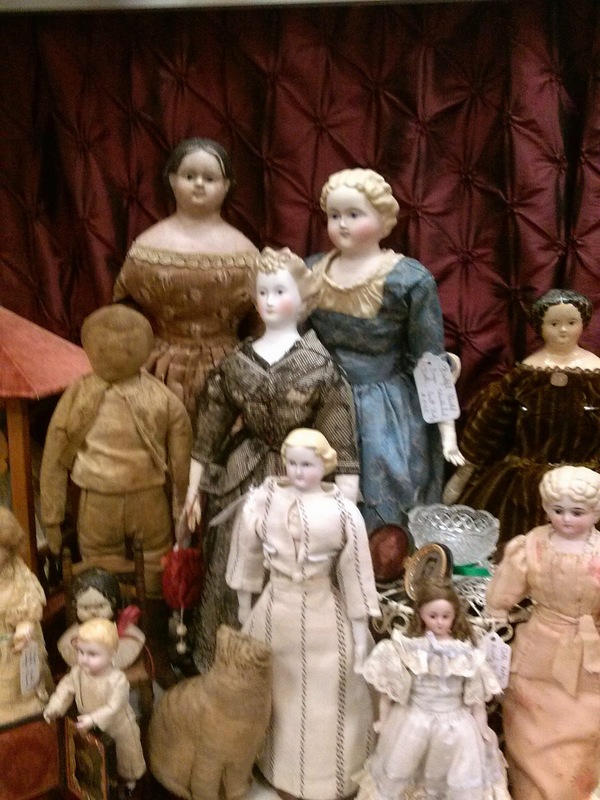 There is a doll show downtown at the same time as the UFDC convention this week in San Antonio. I bought a large papier mache boy like one I used to have though a size or so smaller and a little Goodyear hard rubber head dating perhaps 1855 to 1860, a contemporary of my American pressed linen head dolls. I also bought a tall clock (not antique but well made) the size of my other favorite doll furniture Jack made. A small old doll quilt and a little blue striped dress were easy additions. A very large Steiff bear, signed, came home but is too large for the case I wanted to put him in. One of the replicas of a few years back, this one is the cream colored Margaret Strong bear in the largest size. He looks a lot like my replica 1906, lost in the house fire. That bear I called Elvis because he said to me in a deep bear voice “I wanna be your teddy bear”. This one I call Rowbear for the show promoter. As there were 5 bags, most heavy, It took two extra people to get me out of the hotel and onto the sidewalk. It was a parade with Rowbear the bear looking over the top of his sack. 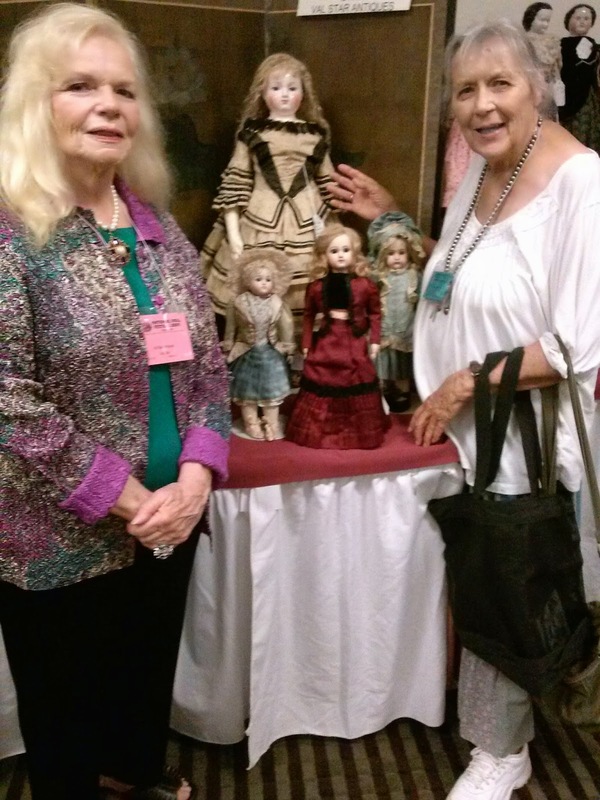 There was one spectacular big fashion doll there shown with her owner, Val of Val Star Antiques in IL. It was my favorite doll for best in the show. In this picture in front of the Ida Gutsel cloth boy, see the tiny shoulder head? I did not see it till I lifted the Gutsel boy out to look at him and then saw the early little Goodyear head! I could not leave the clock, it keeps time and chimes from a battery run works. Close ups of my purchases will be posted soon. With the warmer weather, early mornings are the time to pick a few tomatoes, change the water in the bird bath, do the small things outside. I am out again late evening, to walk and enjoy the neighborhood. Now there has finally been time allotted to arrange a sewing nook. These pictures look like I am sewing in a dark place, not so, it is a matter of my camera's auto setting which picks up and tempers the brightest light. I want to find a little model 20 singer to add to the shelf above my featherweight. I have two of the featherweights in very good shape so that if one is off being serviced, the other is here to use. 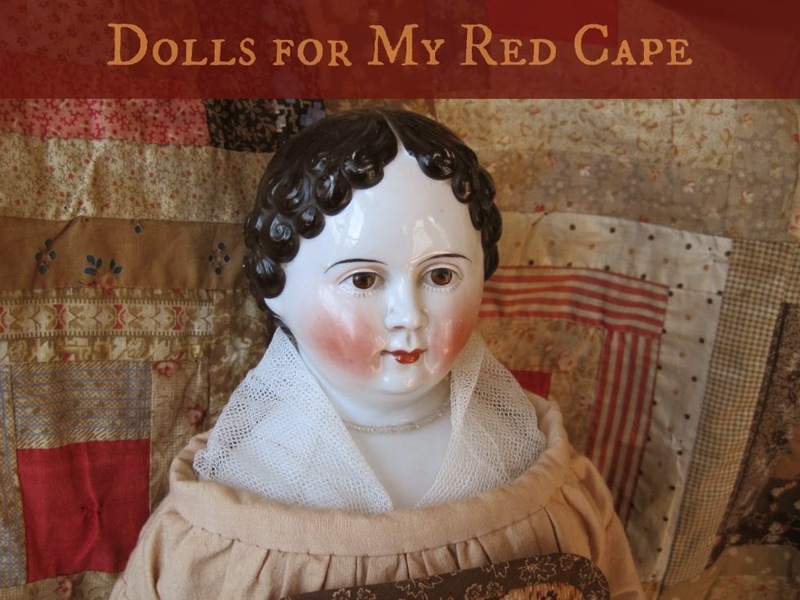 There are so many stitches needed to care for a doll collection and the accessories one displays with it. I sew some of the smaller accessories in place for safety. Miss Greiner is quite please with her new old basket. I took a few stitches by hand to make a loop around her arm to secure the basket. 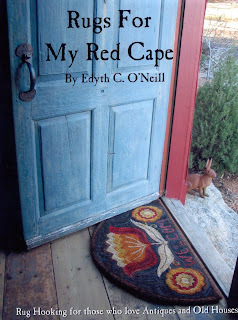 The book Rugs for My Red Cape is now offered in pdf electronic file form. You may download the book to your computer to read it there as a single or double page spread. Purchasers of the PDF book may print any and all pages from your computer for your personal use. Please respect copyright. All material on this site copyright Edyth O'Neill 2015.. Simple theme. Powered by Blogger.